Species-specific diagnosis of rhinovirus infections: Mission possible? Major factors triggering asthma attacks are allergens and infections by rhinovirus, the cause of common cold. Whether an asthma attack is really caused by a rhinovirus infection could not be firmly established so far because only nucleic-acid based strategies for virus detection have been available but no serological tests measuring rhinovirus-specific immune responses. We developed the “PreDicta” chip which contains a large collection of micro-arrayed peptides and proteins representing the currently known rhinovirus species and strains. Our study shows that one can identify the culprit rhinovirus species in children with wheeze attacks by measuring strain-specific increases of antibodies with only a drop of blood. We could not only identify the culprit virus species having caused the wheeze attacks but our data also indicate that certain species are especially dangerous. Using the rhinovirus chip many important open questions can be answered. For example, it can now be studied if rhinovirus infections trigger also exacerbations of other respiratory diseases such as chronic obstructive pulmonary disease (COPD). The worldwide analysis of rhinovirus infections as triggers for respiratory disease attacks with the high resolution chip will also identify the clinically most relevant rhinovirus strains for the rational engineering of a vaccine for rhinovirus infections, a much after sought goal in vaccinology. Another unanswered question which can be addressed with the chip is: Will it be possible to predict the course of a respiratory disease based on RV-specific antibody levels measured at certain time points or age? We think yes, because many longitudinal population cohorts have been established in which clinical data and serum samples have been collected and can now be analyzed with our chip. 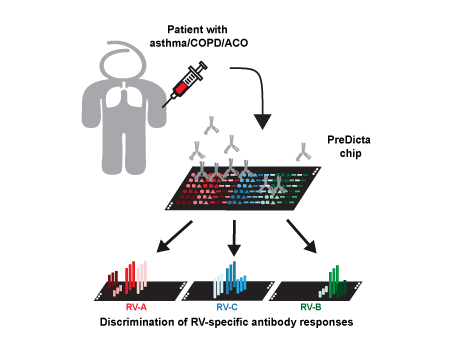 “PreDicta” chip will allow identification of the culprit RV species in patients with underlying respiratory diseases (Asthma/COPD/ACO) by measuring strain-specific increases of antibodies with only a drop of blood.